When celebrating Hanukkah, it's easy to forget that Hanukkah candles are open flames and can result in burns and home fires. Here's how to ensure that you and your family have a safe Hanukkah celebration! Hanukkah, the festival of lights, is a beautiful holiday when family come together. Those lights however can be dangerous; keep in mind that, when you’re lighting the Menorah, you are playing with Fire, literally. In fact, more candle fires occur during the month of December than in any other month! While candle fires that result from Hanukkah celebrations are not broken out separately, it's always a good idea to follow safety recommendations whenever lit candles are involved. 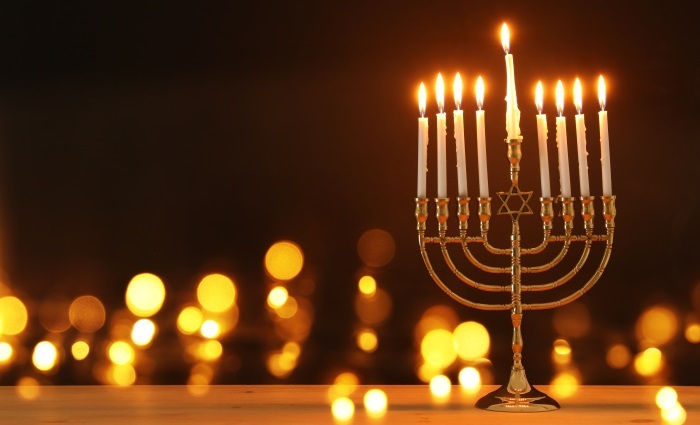 Here are some tips for ensuring that you have a safe and fun Hanukkah celebration! • Your Menorah should not be placed in high traffic areas or where it’s likely to get knocked over. • The Menorah should be placed on a sturdy, non-flammable, surface such as marble, glass, or metal. • Hanukkah candles should fit snuggly in the Menorah. If they don’t, replace your candles. • Keep your Menorah far away from curtains and other flammable objects. • Your Menorah should be kept safely out of reach of small children and pets. • If publicly lighting the Menorah, consider purchasing a separate electric Menorah to place in your window. The more candles, matches, etc. that are kept out, the greater the chance that something could happen. We recommend keeping only the “helper” candle out, putting everything else away until you need it. It’s easy to forget, but a lit Menorah can be a serious fire risk. Whenever leaving the house, be sure to double check that the Menorah is not lit and that the candles are not still smoldering. Are your smoke detectors working? Take some time to go through the house and test all of your smoke detectors. Change out the batteries or replace the smoke detectors as needed. Did you know that smoke detectors expire? We hope you and your family have a wonderful Hanukkah! As always, should you ever have a need of any of our services, please don’t hesitate to Contact our Offices!